Thanks for checking out the new blog! You are probably here from real estate style. Please click on the "about" section above for a little more history. I hope it's not too strange to name a blog after a high chair. It's really not any high chair though. 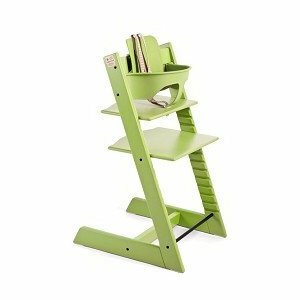 Our new/used little green chair is a Stokke Tripp Trap. Before you look it up, and think I am completely nuts for spending that much $$$ on a highchair let me tell you this, ours came from Craigslist!!!!! MUCH less expensive. In fact, I will call it affordable. It also came with the infant insert which also costs way too much brand new. It was a very quick, last minute decision to pull the trigger on it. As soon as I saw it, I loved it! Sort of like Charlotte :). Look how cute! I will go into more detail on my highchair search in another post. Back to the blog introduction. My old blog, real estate style, is still up and available to read. I originally started the blog on Blogger, but after some time I changed over to Wordpress. I was never comfortable making changes to the blog myself on Wordpress. When I looked into changing it back over to Blogger, I learned that's not really possible. Or at least, not very easily. So, my dilemma was to continue on with real estate style on Wordpress, and just educate myself more. Or, start an entirely new blog back on blogger. So, here's where we are. 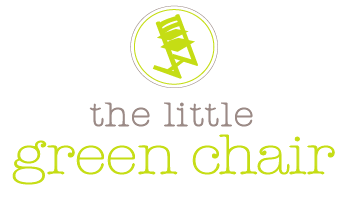 Brand new blog called "the little green chair," but the content will be very similar to what I used to post on real estate style! Blogging has been a fun outlet for me, and I just needed some time to focus on the new baby at home. Charlotte is almost 6 months old, and time is flying by so fast. I want her to grow like she's supposed to, but I also want her to stay small and sweet like she is now!! She has been the biggest blessing to us, and we think she's pretty perfect. Another change you might notice on this blog as compared to the old one is the list of favorite blogs. Once I discovered Google Reader a long time ago I went completely crazy joining blogs. My reader has over 450 blogs on the reader. Who has time to read that many blogs? So now I am listing a few that I actually do try to read from time to time. I also like the format here on Blogger where you can see a thumbnail pic from the blog's most recent post. This is more fun for me than cruising through a reader. So I am taking it back old school. Another favorite is pinterest. Sometimes it's easier to check it out versus reading blogs. Congrats on your new baby, and I'm glad to hear everything is going well. My hubs doesn't want me to post photos of my boys either. You will occasionally see the backs of their heads, but thats it. 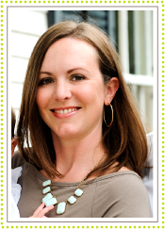 Best wishes to you on your new blog!